Eros Ascending, by Mike Resnick: Science Fiction story set in a barbell shaped brothel / space station. That’s no moon, it’s a brothel! Like any Resnick work I have encountered, Eros Ascending is a highly entertaining novel with some interesting and competent characters, and a joy of storytelling that obviously comes from Resnick himself. He just HAS to enjoy telling these stories. This one is from early in his career and features the villain as the protagonist turning into the hero. And it's set in a spacestation shaped like barbell which happens to be a brothel and the nitty gritty of the brothel really isn’t the point, it just makes an excellent conversation piece. Eros Ascending is the first of four novels (I believe) set on the Velvet Comet. 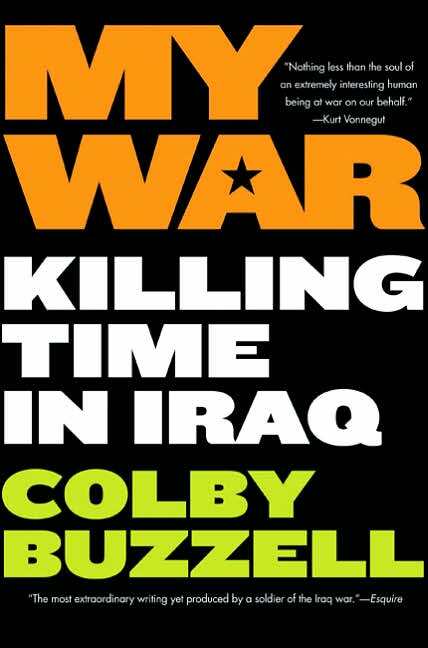 My War: Killing Time in Iraq, by Colby Buzzell: Buzzell gained notoriety as an Army Blogger posting entries from Iraq giving an honest soldier's account of what life was like on the ground. He compared what really happened to the media's account (or even the official version). Naturally he was pressured to stop writing. My War is mostly memoir of how and why Buzzell joined the Army, his training, and his subsequent deployment to Iraq. While other recent books have covered much the same ground (The Interrogators, Generation Kill, etc), My War is a raw, gritty account told in a conversational style. In many instances My War reads just as if Buzzell was sitting there explaining how things were. Midway through the book we get to the part where Buzzell began his blog and Buzzell includes the full blog entries. Some are Q&A's, others just explanations of what was occurring. At first this was a bit off putting as the inclusion of blog entries really messed with the flow of the narrative and the flow of the writing, but eventually the entries fit better with the book and was interspersed with more recent writing by Buzzell. Overall, My War: Killing Time in Iraq has to be viewed as essential reading for understanding the soldier's experience in Iraq. It's a difficult book because of the content, but very readable. Highly recommended. Dead Until Dark, by Charlaine Harris: With the first Southern Vampire mystery Charlaine Harris introduces the reader to Sookie Stackhouse, a waitress who can read minds. In small town Louisiana Sookie is considered weird, but when a vampire walks into Sookie's bar and she can't read his mind she sees the possibilities. But then people begin to die and Sookie's new vampire boyfriend is automatically a suspect because vampires have only been public for four years now and the new racism is vampirism. This is a mix of mystery, the supernatural made natural, down south living, romance, and almost horror. Combined it is nothing more than a damn good story told well. Dead Until Dark moves along at a brisk pace and really hits its stride near the end of the book when everything comes together. Dead Until Dark is a fun book to read that you won't want put down and when the book is finished you'll want to grab the next volume in the series.